The creation of Facebook has changed the way that we look at our entire lives. Since 2004, when it was first launched, the site has forced us to reevaluate how we look at privacy, how we conduct ourselves in public and how we interact with our peers. Despite the numerous faults that can be found with the site, it is a remarkable innovation, one that is here to stay. David Fincher's film chronicling the story behind the creation of Facebook is a fascinating, well paced film that has almost no right to be as good as it is. Penned by West Wing creator Aaron Sorkin, The Social Network is almost certainly a dramatic interpretation of what really happened. Events seem to line up as they have in real life, and Facebook creator Mark Zuckerburg has noted that the film is fairly inaccurate, especially when it came to his motivations for starting in the first place. Regardless, it's extremely well written, acted and directed, a film that stands on its own merits, rather than something held up by its own novelty. Alienating his date, Zuckerburg (played by Jesse Eisenberg) returns to his dorm room where he hacks into Harvard's internal social sites, downloads pictures and puts them together in a site where people are compared and ranked. It's a degrading exercise, but one that's revealing: the site receives over twenty-two thousand hits in a day, taking down Harvard's network, and getting Zuckerburg and his friend, Eduardo Saverin (Andrew Garfield), thinking about what to do next. Approached by Cameron and Tyler Winklevoss to create a social network of their own, Zuckerburg turns around and creates his own site, launching it as an exclusive online site for Harvard and surrounding area students. The film splits itself between Zuckerburg's college years and several intense questioning sessions by attorneys from the Winklevoss twins and Saverin himself as they try and prove wrongdoing on Zuckerburg's part - the twins claiming that he had stolen their idea, while Saverin was trying to leverage the money that he lost when he was pushed out of the company. The juxtaposition shows how much things could change within a few short years. 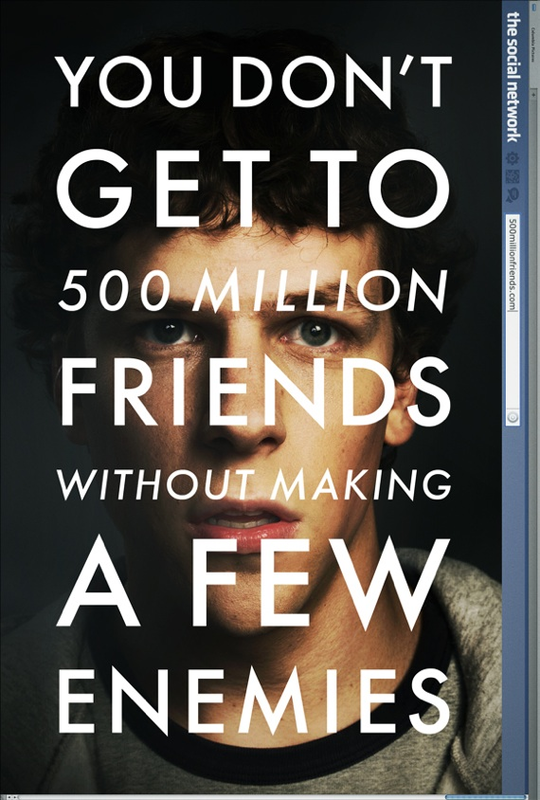 The Social Network isn't about Facebook, or really even about the creation of the website. The film's true themes come from the title, and are ultimately an intense character drama between Zuckerburg, Saverin and Justin Timberlake's Sean Parker and their own interactions. Facebook has become an intense issue in the public lime-light, and the film's creators did well to frame their film by the people involved. The Social Network is ultimately the relationship between Zuckerburg and his friends, and ultimately the rest of the world. It's complicated, as Zuckerburg and Saverin face off against one another, backed by their lawyers, and the tension is incredible. This is a film that is far more compelling than it should be. It's a film about a couple of geeks, working to push against the established social order that they've been told to work in. Zuckerburg has gone on to upend how we interact with one another. Parker notes that while his first company, Napster, was sued and killed by the music industry, it completely changed how people looked at buying, distributing and listening to music. The film also plays up the conflict between the Winklevoss twins - rowers who would go on to the Olympics - as the jocks against a diminutive Zuckerburg who beats them at their own game. Coders are selected by a complicated coding marathon and drinking game that wouldn't seem out of place for a stereotypical sports team - minus the computers and technobabble about what they're coding. Facebook, like some of the other earth changing events and creations in human history, was created by the nerd. Bill Gates, Elon Musk, Albert Einstein and numerous others can likely count Zuckerburg amongst their numbers for the changes that he's pushed upon people, for better or worse. The Social Network, while likely a fictionalized account of true events, is a fascinating take on the people behind the creation of Facebook, and I'm sure that there's some truth behind parts of the story. As someone who's used the website since it began, when it was invite only with a college e-mail address, it's astonishing to think about how much things have changed - there was certainly a nostalgic pang seeing the original masthead and layout. Up for several Oscars, Fincher's film has received a lot of critical acclaim, all of it well deserved for this highly relevant and thoughtful movie.